We recently received a $3M training grant from the National Science Foundation (again!). We’re thrilled, surprised, and a bit daunted. And we’re also getting lots of questions. What makes for a strong funding proposal? And what does it take to build a successful interdisciplinary program? Well, we generally only get the first question, but the second one is more important, and ought to come first. I don’t have definitive answers, but I can offer some thoughts on what has worked well for us. TL;DR: take a long view, communicate your values, ensure student ownership, assessment really helps. And our proposals are here and here. These NSF training grants are attractive, but not easy to get. IGERT had a 5% success rate, and NRT was 3%. And that counts only the teams that made it through institutional competitions to be chosen as the 1 or 2 proposals that NSF allows from each institution. NSF does not do renewals, so consecutive awards are rather uncommon. (We know of only one other example with a strong social science component.) So this is not a generalizable model for funding a graduate program, and don’t let your dean tell you that it’s a way to compensate for budget cuts. We were doubly surprised to win the NRT this year, as we had only 2 weeks to put the proposal together. We were initially turned down in the institutional competition — we weren’t too happy about that — and then got drafted only when another team withdrew. We decided to proceed only under the assumption that we were practicing for a second attempt this year. Our experience with the earlier IGERT award was that it took a couple of attempts before we succeeded. (In fact, since that competition had internal + pre-proposal + full proposal stages, our successful proposal was our 5th attempt.) We wouldn’t recommend the 2-week strategy to others. We were only able to do this because we had been planning for a long while, and because of our previous experience (and our wonderful team). NSF views its graduate training programs as “experiments” in new training models. This should be taken seriously. A good experiment aims to provide knowledge that is (i) new, and (ii) generalizable. Applying this to graduate training, this means that it’s not sufficient to simply do a really good job of implementing current best practices. Yes, you really ought to get a lot of credit for doing that, but NSF is unlikely to pay you for it. It also means that you need to be testing approaches to training that could be successful even in the absence of government support. So you need something that, if successful, will be attractive enough that you and others (in your field, in your institution) will want to implement it anyway, not just because you’re trying to impress a funding agency. Why do agencies like NSF want to see changes in graduate training? Well, do you think that current approaches are optimal? Training practices haven’t changed a whole lot in the past century, but the expectations on well-trained scientists have changed a lot. And it costs $250,000 – $400,000 to train a single PhD (do the math, it’s scary). Students mostly work as apprentice scientists with a single mentor, doing state-of-the-art research in the mentor’s field, and mostly learning how to be like the mentor. But PhDs face increasingly diverse career paths, they’re expected to be entrepreneurial, expert communicators, broad collaborators, and managers. And since science changes quickly, they need to be able to be lifelong innovators — what’s hot now had better not be hot 25 years from now, and you don’t want to be left behind. Everybody talks about how it’s important to be innovative, flexible, interdisciplinary, collaborative, blah blah blah, as if it’s just trivial to do. But it’s not. That’s why it’s valuable to explore ways of making it happen. Our IGERT program has been unusually successful. The NSF funds helped to support 25 students (for 2 years each), but a total of 50 PhD students pursued the program. The program led to lots of new collaborations, course, and projects, and it was the starting point for our 17-department Language Science Center. It also inspired PULSAR, our new undergraduate interdisciplinary program. It has helped to make our field one of our institution’s main research priorities. Most importantly, it has built a strong research community that easily outlasts any individual injection of funding. We’ve learned a lot along the way about things that do and don’t work (for us) for building a successful interdisciplinary graduate program. At this point, we don’t have solid enough evidence for any of these claims, but here are my best guesses. Take a long view. It is not worth building something purely for a 5-year grant project. By the time things get going it’ll be almost finished, and people won’t buy into it. We started work on building our program as early as 2002, up-ending the traditional curriculum in my home department (Linguistics) and starting to develop mechanisms that by 2006 made us ready to start applying for IGERT. We worked on building connections between departments well before we applied for funding, and we have consistently emphasized that we are working on things that we would like to do whether or not we get outside funding for them. Student ownership. This is something that we didn’t get at first, but I heard about it from lots of successful IGERT PIs. At first our IGERT students were mostly passive participants. After a couple of years, a student coup, led by Shevaun Lewis, led to dramatic changes in program organization — student-led teams were now responsible for most program activities — and dramatic improvements in program effectiveness and morale. Leadership training is also a valuable addition to students’ preparation. Community values matter. Students and faculty won’t buy in to a program unless it aligns with community values, and unless those values are clearly endorsed by the most influential faculty and students. If your most successful faculty and students clearly believe in diversity, or in outreach, or in collaboration, then it’s much easier to convince others to believe in it. And sometimes you have to convey these values explicitly. Some things that seem like distractions aren’t. One surprise was the benefits to be gained from non-research collaborations. When students and faculty work together on outreach, on organizing events, on program management, they also are more likely to collaborate in research. Research collaborations are high commitment, high risk. Developing connections through other activities is a lower-risk starting point. Assessment really does help. Like many other academics, we rolled our eyes when we had to meet with our assessment team, and we didn’t quite see the point of having an external advisory board. But we learned that regular, candid (formative) assessment really does make a difference. We have put all of our assessment materials and reports for IGERT online. Science is social. This is one of our mantras. And it’s not exclusively an excuse for having more parties. People who get along with each other are more likely to work together. And interesting ideas arise through fortuitous interactions. That’s why bringing people together regularly helps. Either by creating shared space, or by exploiting opportunities for spending quality time together, as in our annual Winter Storm workshops. Be inclusive. It’s nice to get a big pot of grant money, but walling it off for a privileged sub-group is not a way to build a sustainable community. We went out of our way to bring in as many people as possible to the community. That’s why we created Language Science Day, an internal event that brings together 150-200 people each year. And it was especially important that we not exclude international students, who NSF would not support via IGERT funds. I was myself an international student in an NSF-funded training program where I was ineligible to receive NSF support, and I really valued that MIT helped to make US/foreign student funding differences invisible. The international students from that program have fared well: 1, 2, 3, 4, 5. Thanks to generous support from UMD’s College of Arts & Humanities (thank you!! ), we were able to fully include international students, and they are also now doing well: 1, 2, 3. You gotta really care. It really helps if you’re fascinated by training, and really enjoy thinking and reading about it, and telling other people about it. And it helps if your colleagues care too. That’s what leads to real improvements over time. I have been lucky in this regard. Ensure that participants really care. Most IGERT/NRT programs use the high NSF-supported stipends ($30-$34k/year) as incentives for PhD student recruitment. We never did this. We recruited students to our interdisciplinary programs only after they were already enrolled at UMD. Why? We don’t think that it’s a very effective recruitment tool, and it means that some students join the program for the wrong reason, and others who are well-suited for the program miss out. It also sacrifices opportunities to use program applications as a part of training, and to get buy-in from faculty and departments. Almost all of us are struggling to maintain graduate student funding, and we’re looking for ways to being in extra support. I’m sorry to say this, but if that’s your main need, then it’s not worthwhile for you to apply for an NSF training grant. If your chair or dean thinks that this is the way to go, tell them to think again. The success rate is low, it requires a whole lot of work, and I think it requires a bunch of institutional support for it to work. It is only worthwhile to do this if you and your colleagues are really into the training program that you’re developing, and if you all want to commit your energy to it for a long time. I have met many IGERT PIs who felt burned out from the experience of organizing things with minimal support from their colleagues, and who were not interested in even trying for continued support. And it is only worthwhile if you’ll have strong institutional support. (Though new federal rules make it hard to officially document this.) Institutions should see these programs as ways to build teams and programs, not as ways to make money. After all, there’s not a whole lot of money to be made. A team that has its act together well enough to be competitive for an NSF training grant is a team that is worth investing in … even if the team doesn’t quite make the cut in the national competition. Writing a training grant proposal is different than writing regular research proposals, though there are some aspects that are similar. The following are some things that I have paid attention to, though I have no evidence that they were instrumental in our success. Know thy reviewers. Well, you’ll never know who they are, since NSF does not publish the names of its reviewers, unlike NIH. But you should assume that most of them don’t know you or your field, and you should think carefully about what that means. Not only do they not understand the research that you’re writing about, they have no reason to know how awesome you and your team are. So you need to find ways to explain this to them. Provide context, avoid writing that sounds like insider-jargon, and make use of all available tools to convey the virtues of your team, e.g., via carefully crafted biosketches. Get the reviewers excited. In tight funding competitions it’s not enough to have reviewers admire you or your proposal. You need them to be excited by it, and ready to go to the mats to argue that yours just has to be the one that gets funded. Read your first few paragraphs, have (honest) friends read it, have your mother read it. If they’re not really into it, you might want to go back and try again. At one point in our IGERT preparation I thought I had a really neat statement of our goals. I showed it to Ken Gertz in our Division of Research. He looked bored. I thought he was a soulless philistine to be unexcited — but he was right. We rewrote it, and it worked. Avoid death by committee. It’s good to have many people engaged in writing a team proposal. But reviewers want to hear a unified voice (… in a uniform format). It’s easy to identify a proposal that was created by pasting together a bunch of submitted paragraphs, and they are no fun to read. Jones may feel that it’s important to highlight his fascinating work on X, but if the reviewers don’t see the point of that, then it’s hurting your proposal. Leave it out. The reviewers want to understand your big goals. They really don’t care if every individual’s research program gets a shout out. It’s mostly not a research proposal. Really. You’re asked to describe your training program, your assessment plans, your recruitment efforts, and your professional development activities. Take these very seriously. If you devote most of the proposal to your research projects and leave little space for these other things, then you’re doomed. (Remember, the reviewers probably don’t understand the research anyway.) For NRT proposals, there’s a big emphasis on some topics that were less important for IGERT proposals. (i) Assessment is very important: how can you show that your training model really is making a difference? Do you have a control group? How well qualified is your assessment team? (ii) Professional development should be taken very seriously, especially in regard to non-academic careers. In some fields it’s currently the default for PhD scientists to go into non-academic positions, and we suspect that NSF’s thinking is guided by that fact. So it may be important to clarify when the situation in your own field is different. (iii) Scalability: how is this going to impact students who aren’t receiving those generous NSF stipends, either now or in the future. Recruitment for diversity. Yes, you need to have plans, but you don’t need a cookie-cutter plan. Your field almost undoubtedly has too few minority scientists, and in some fields there may be grave underrepresentation of women. You are expected to take seriously the goal of addressing this. But the best way of doing this varies across fields, and you can demonstrate seriousness in various ways. One cookie-cutter way of addressing this is to pay lots of money to go along to events that are specifically designed for recruiting minority graduate students, or by making visits to HBCUs. This may work in some fields, but in ours it certainly does not. We gave it a try, we got nowhere, so we tried other things. There’s no required solution — you just need to show that you’re making real efforts. And what works best will vary by field, by institution, and by location. Avoid clichés. There are some things that almost everybody says. So when you say the same things, they ring hollow. So it doesn’t matter how sincere you are about preparing the “next generation” of scientists in your field, if you use those terms you’ll just sound like every other proposal in the pile. So find other ways to talk about what you’re doing. Use individual stories (successes and failures) to personalize your narrative. That will make you sound less hackneyed. Read other examples. Find what you like. When I was working on our successful IGERT proposal, I went digging around the internet for examples of other proposals. I found a handful, all in areas that I knew next to nothing about. I read them, and asked myself what I liked and didn’t like. It was clear that some excited me, and others left me cold. I remember that a proposal by a team of chemists at LSU really grabbed my attention. This proposal was written differently than most others that I read, and I found it fun to read. I took that to heart when writing our own proposals. Do you have to be an elite program or elite university to succeed? No, the evidence suggests otherwise. Creativity outranks prestige. Will an NSF training grant turn you into an elite program? No. It’s exciting to win one of these, but it’s all pretty opaque to students, and it won’t have much impact on the opinions of the students’ mentors (and parents). A surprising fact is that many of these programs have struggled to attract qualified students, and that the awards have had little impact on the standing of the program. A sustained effort to build an interesting and successful program will make a difference, but the NSF award alone will not. Does the letter of intent matter? Apparently not. We didn’t submit a letter of intent for NRT, because we didn’t even know that we were submitting until two weeks before the deadline. But it might matter that the relevant program officer on NSF’s NRT steering team knows enough about your work to recommend suitably qualified reviewers. Can I see a copy of your proposal? Yes, and yes. And I’ll post links to more if anybody makes them available and lets me know. Really nice summary with great details. Thank you! Links to your documents totally appreciated. Thanks Julia! It’s good to hear when people find these things useful. Thank you so much for being so transparent and including all of this information. I am the Director of an Interdisciplinary Program on Coastal Sciences that bridges the natural and social sciences and I found your proposals to be enlightening. May I ask if you would share the citations for publications that came out of the proposal? Thank you again! Glad you found them useful! 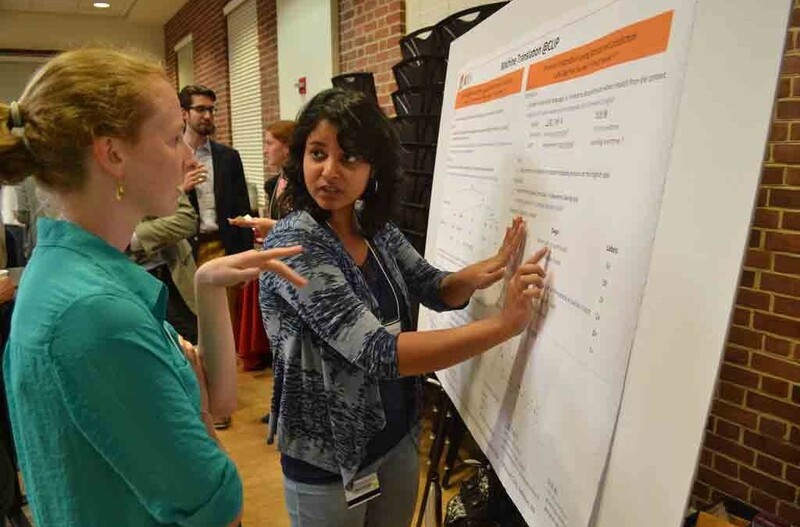 We post all of the reports from our programs on our website at languagescience.umd.edu. We don’t yet have published papers on the training efforts themselves, but we are working on research on that area, and we do have a number of internal reports.